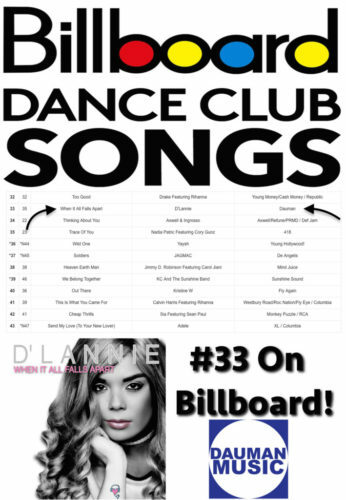 D’LANNIE BILLBOARD DANCE CLUB CHARTS ACTION! Dallas, Texas native, D’Lannie Brown, aka D’Lannie, is poised to make a name for herself within our community, courtesy of her debut single for Dauman Music, When It All Falls Apart. The 21 year old vocalist is the beneficiary of remixes from Dave Matthias, Denny Tsettos & Lenny M, and DJ Yiannis. D’Lannie is signed to Dauman Music and distributed by Sony Red through Big Deal Records. Copyright © 2019 Big Deal Records (A fiercely Independent record label). All rights reserved.